I was careful to say “correlated” above because this graph highlights one of the key ways in which econometrics differs from (the rest of) statistics. Econometrics has an almost singular focus on isolating causal relationships in situations where simple correlations like the above are potentially misleading. That’s its single biggest strength, because humans are great at pattern-recognition and our tendency to jump to causality from observed correlations is hard to overcome. Think about describing this graph to a high school senior who is headed off to college. “People with engineering degrees tend to earn more than people with social work degrees” is something you can say without qualification. 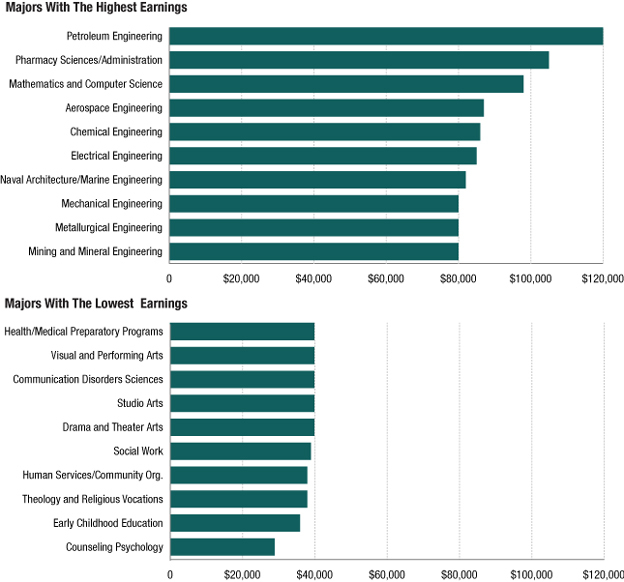 “Major in engineering because you will earn more money” is not. Why not? Well, engineering degrees are hard, and you need to be very smart, diligent, and good at math to finish one. These abilities are things that, in part, you carry with you into college, and someone with that skill set will probably earn more money than someone who lacks it, even if they both choose to major in Studio Arts. The differences in the above graph will hence tend to overstate the benefits of majoring in engineering. Everyone (or at least everyone who has taken Stats 101 course) has heard the mantra that “correlation does not imply causation”. But oftentimes correlations are causal. Econometric reasoning can help us see when they aren’t, and why. It also can give us a sense of the likely direction of the bias (upward, in this case – the effect of majoring in engineering on your wages looks bigger than it actually is) and what you might do to get better inferences (try to get your hands on pre-college measures of diligence and math ability). In its sophisticated extreme, econometrics is employed by (very clever) economists to isolate the actual causal relationship in question, say the impact of college major choice on eventual earnings. I don’t know the right answer to the question of how much majoring in engineering will increase your earnings, but if you got a BA in counseling psychology, you can take some solace: that probably didn’t cost you a full $50,000 per year. However, it also wasn’t free, and college students should definitely pay more attention to that cost – and other associated costs, like higher unemployment rates.